We're choking on forest fire smoke here in the LA basin, especially in the San Gabriel Valley, so I thought I'd pass on some health tips. These are especially important for people with respiratory issues and heart problems, the elderly, and children. "Take special care to protect children," says Norman Edelman, M.D. and Chief Medical Officer with the American Lung Association (ALA), "They are more susceptible to smoke because their respiratory systems are still developing." Yes, shut your windows, and don't exercise outdoors. The American Lung Association says if you're going to use a mask, make sure it's labeled "N95" or "P1000" and comes with two straps for a tight fit. Ordinary masks will filter large particles, but leave you vulnerable to the tiniest particles, which are especially dangerous. 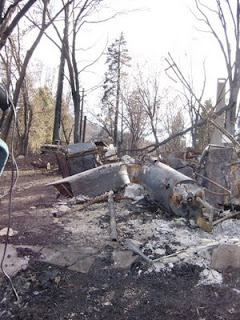 If you have ash in your home, use a damp cloth to clean it up, not a vacuum, which can send some of the ash flying. Last night before I fell asleep, I found myself tucked in bed, perusing the pages of National Wildlife Federation's (NWF) Your Big Backyard--alone. That's right, I was reading a magazine for preschoolers by myself. I enjoyed the photos of darling sifaka lemurs, and, yes, comparing the beak shapes and sizes in an article called "Take a Peek at Beaks." We just started my son on Your Big Back Yard, which is written for ages three to seven. It contains a nice mix of simple nonfiction articles on animals and not-so-factual stories, such as the adventures of Ricky Raccoon. I recommend it. We're still reading NWF's magazine for kids under age four, t00. Wild Animal Baby comes in a sturdier, smaller format. 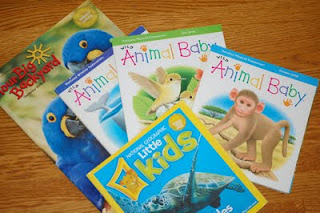 It includes very simple articles about animals, poems, a simple game where babies match an animal cracker on one page to the real animal on the adjacent page, a story about kids encountering nature, and more. My son loves the stories and still asks for them by the characters' names. These magazines are big hit with all the little kids we know. Indeed, my five-year-old niece won't part with hers. Our family also likes National Geographic's Little Kids. This magazine covers nature and world cultures in a format aimed at preschoolers. It includes stories and games. A nice touch is the punch-out animal cards that come with each issue. For older children, check out National Geo Kids. National Wildlife Federation also publishes Ranger Rick for young people over age seven. I'm a big proponent of California natives and other Mediterranean-climate plants, but I can be tempted by beautiful blooms of all sorts. Recently, I was asked to write a short piece about cannas for the Home section of the Los Angeles Times. Reader, I developed a bit of a crush on this Victorian era plant. They're probably too thirsty for my garden--although many plants can do with far less than we think--and the tropical look just doesn't fit, but I wouldn't begrudge anyone a canna or five, especially if they're put to good use. Nurseries, including Schoustra's, commonly use cannas in bioswales to keep polluted water (i.e. enriched with fertilizers) from running off their lots. However, if you're looking for a place to cleanse grey water, a patch of cannas could be a nice fit. "They're greedy pigs," says Schoustra, "They don't have to have a ton of water and a ton of fertilizer, but if it's there, they will take it." Or you might try what I've done with quite a few conventional garden plants: cut back water and see how they do. "I don't look at them as being that thirsty," says Randy Baldwin of San Marcos Growers. "They're tough plants. They grow better with more water, but they have durable rhizomes." 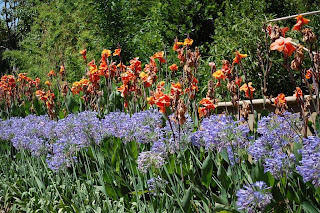 Baldwin and Schoustra recommend the orange variety 'Intrigue' as especially drought-tolerant. 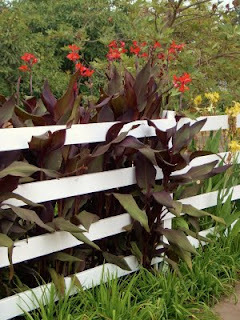 Schoustra advises giving cannas abundant water when they most need it--summer months--then cutting back in the fall. "The first week in September there's a little clock that goes off in most perennials in Southern California," he says, "and they stop having so much sugar in their system, they start storing starch for the winter, and their water needs drop off a great deal." A suite of viruses has beset cannas in recent years. They mottle canna flowers and foliage and generally weaken the plants. Randy Baldwin says the variegated varieties are especially prone to infection. But wait, there's more! 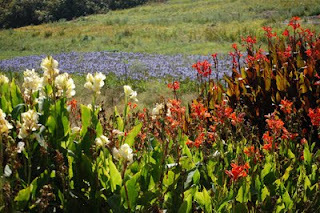 To find out the secret to robust canna blooms, read my short LA Times piece. I have to stop apologizing for how my garden looks at the end of summer. Sure, it's not at its most colorful, but, you know, it doesn't look too shabby either. Purple-black globes dangle from my native grape--the hybrid 'Roger's Red' to be precise. My coffeeberry bushes (Rhamnus californica) sport petite red and black orbs. Goldfinches are feasting on the seedheads of cosmos, but delicate pink blooms continue to emerge. 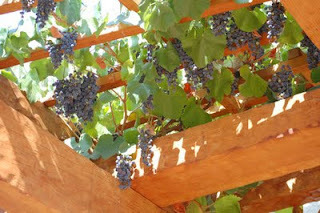 I planted two of the grapes to cover a large arbor over our backyard patio. They're lovely. And they're helping us reduce our energy use. The broad green leaves provide shade in summer, cooling both the patio and my office. In winter, the leaves blush, then drop, allowing sunlight to warm the patio and house. We're now contemplating what to do with the grapes, which are small, seedy and sweet. My two-year-old loves to eat them, but we have more than even he can pillage. Our friend Eric Callow, a board member of Rancho Santa Ana Botanic Garden, says he plans to make jelly. We hope to follow his lead. My copy of Edible and Useful Plants of California offers a recipe. I'm told others have made wine. Hmmm. 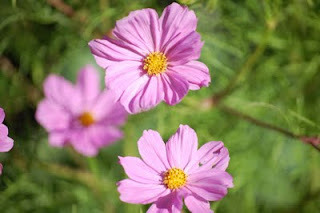 Back to the cosmos for a minute: I've grown them for years because they adapt well to our climate. These Mexican plants are fairly drought-tolerant and self-sow readily (i.e. sprout up year after year without replanting). You can also snip some for indoor arrangements. Has your kid been nagging you for a pet? Tell him you'll give him not one but thousands of pets. These composting redworms aren't just easy to keep--they earn their own keep. 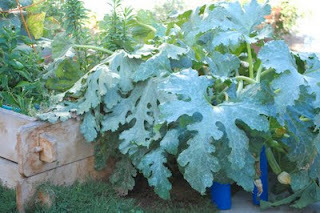 Just feed them kitchen scraps and they'll thank you with great compost or fertilizer tea for your garden. My son likes to watch them squirm in his hand. 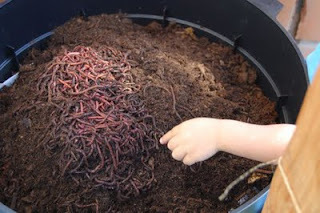 We bought our Can-O-Worms earlier this year from All Things Organic. I was frustrated with the slow progress of my regular compost bin, and tired of buying fertilizer. We've already fed our watermelon plant some of the "tea" you can drain from the bottom of the can. Eventually, I'll harvest some of the castings (i.e. manure) to add to my soil. According to All Things Organic, worm castings provide a slow, steady release of nutrients to feed plants. And worm castings are loaded with humic acid, which is "a natural soil 'glue' (binding agent) that is vital in binding humus with mineral soil, and helping to prevent it from being washed away." Next, some larvae took up residence. I think they are Soldier Fly larvae. I've been scooping them out and tossing them in the garden for birds to eat. According to All Things Organic, they don't threaten my red wigglers or harm my compost. They're just yucky. All Things recommends you leave them alone, let them develop and fly away. My copy of Insects of the Los Angeles Basin informs me that they occur naturally in garden soil, and do not bite or sting. For more than you'll ever need to know about worms and composting with them, check out Worm Digest. It's been too hot to hike. But we snuck a short one in at Griffith Park last Sunday, plus an hour of play at Shane's Inspiration Playground. Our toddler had just started sleeping in a bed instead of a crib, and we were looking to tire him out. 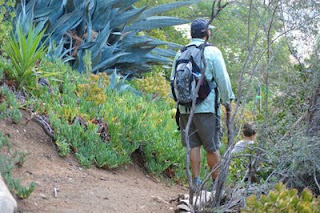 We hiked the short (1/2 mile) trail to Amir's Garden. A volunteer, Amir Dialameh, landscaped this area with exotic plants. 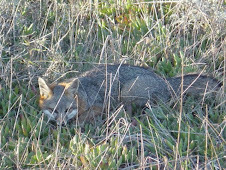 Although I wish he'd opted for native plants, the area is a lush, cool respite. The steep, little paths that run between the dense vegetation are fun for kids to explore. 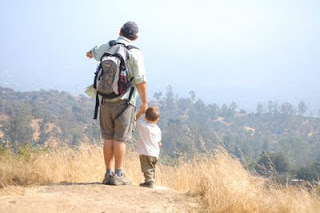 The first 1/4 mile of this trail is steep, so this is a better hike for kids over five. (Our two-year-old climbed on dad when the going got tough.) The trail levels out once you hit the water towers. The trail to Amir's is an unpaved fire road; it's hot and exposed, so don't hike it midday. Still, you cool down once you get there. The benches make it a nice spot for a snack. If your kids are still energetic you can follow the trail further uphill. We turned around and headed for the playground. You can also couple this hike with pony rides (and train), the Merry-Go-Round, or Travel Town, all of which are fairly close by. From the intersection of Griffith Park Drive and Crystal Springs Drive (next to Shane's Inspiration Playground, just north of the Merry-Go-Round), follow signs for the Harding Wilson Golf Courses Club House. Take Griffith Drive past the Club House to Mineral Wells Picnic Area. Just as you arrive at the picnic area, look for the junction of three trails, including a wide road that heads to some water towers. That's your trail. From the NW corner of the park, look for the intersection of Zoo Drive and Griffith Park Drive (near Forest Lawn cemetery). Take Griffith Park Drive (heading SE) to Mineral Wells Picnic Area. At the southern tip of the parking lot, look for the junction of three trails, including a wide road that heads to some water towers. That's your trail. Or try these directions sent to me by the volunteers who maintain the garden. Many in our neighborhood turned out for our annual block party last night. Our family offered up some homegrown zucchini for the grill, but were bested by Joel's cucumber, tomato, bell pepper salad. 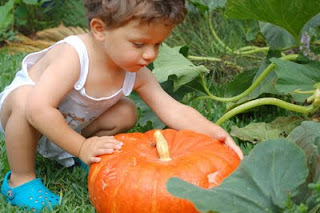 Though I did impress people will tales of our prolific pumpkins. And I made note of who's got what for future bartering. At the end of this post, I'll tell you about a class that can help you start your fall/winter vegetable garden. As I predicted, we harvested our first fruit before July 4. These are Renee's Antique French Pumpkins. They're good for eating and carving. Mini pumpkin pies (basically pumpkin custard smoothed into cooked pastry dough and baked in a muffin pan). Pumpkin smoothies: yogurt, banana, pumpkin puree, orange juice. Pumpkin smoothies II/popsicles: pumpkin puree, frozen mango pieces, banana. Pour the leftovers into popsicle molds. 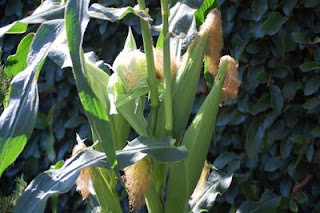 We also grew a bit of corn. It was delicious, but bolted on the first really hot weekend. Just as I was ripping it out, I noticed it had formed ears at the very bottom--which our local Possum had already discovered. As I've mentioned, we're pesto crazed around here, so we like to throw our corn, zucchini, and tomatoes into a pasta dish with homemade pesto. and the greatest of these is... Sun Gold! These sweet cherry tomatoes have been producing for two months and are still at it. I think the expression one zucchini plant can feed a family must be wrong. Our Mexican Zucchini is feeding a neighborhood. Best of all, it's super kid food. Grated it sticks to anything (i.e. can't be picked out and dropped on the floor). You can toss some on the top of your rice for the last five minutes of cook time. Then enjoy it with lunch, dinner, or breakfast. Yup. Warm the leftover rice with milk, honey and some fruit. I'm already dreaming about fall/winter veg. If you are, too, but aren't sure how to get started, one option is to sign up for the The LA County Arboretum's Square Foot Garden Class. I'm curious to see if Jo Ann Carey, the instructor, recommends an alternative to peat moss, which makes up a third of Mel Bartholomew's recommended mix for these dense gardens. Large scale harvesting and shipping of peat moss is not sustainable. 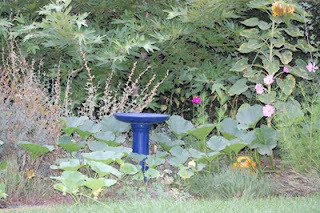 At a recent Theodore Payne Foundation class Steve Gerischer of Larkspur Garden Design recommended using Coir instead. In any case, here's the class information, as described by Arboretum staff. Nothing compares to the flavor of food that is grown in healthy soil, without pesticides, and allowed to grow until just the right time for harvesting. Square foot gardening uses only 20% of the land space of a conventional garden and saves both water and time. There is no tilling of the soil so anybody can do it. This method will be fully explained so you may create your own square foot garden, with lessons on setup, planting, watering, growing vertically, pest control and harvesting. The Natural History Museum Rocks (and Hops)! And the Emmy goes to...the education staff at the Natural History Museum of Los Angeles County. I'm so pleased to see the Museum put energy into programs beyond dinos. Encouraging kids to appreciate living creatures should increase the chances future generations will get to see wild frogs not just zoo and fossil frogs. A great example: the Museum's new Hop, Slither & Stalk program. Performers transform themselves into animals using costumes and puppets made from recyclable materials. This includes some very creative uses of garden gloves and file folders. 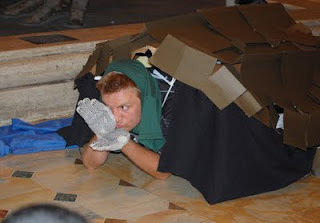 An educator (uncostumed) provided narration and encouraged the kids to hop and crawl like frogs and turtles. This program is designed for kids age three to nine, but all ages are welcome. Future episodes include Buggin' Out (insect puppets), Metamorphosis (featuring a 25-foot-long caterpillar puppet), and Where do YOU live? (about animal habitats). These are short programs, so arrive on time and plan to take in other exhibits and programs, or drop by the Discover Center, on the ground floor. Hop, Slither & Stalk runs Wednesday through Friday at 10:00 a.m. and Saturdays at 1:00. It's designed for kids participating in camp programs, but all museum visitors are welcome. Look for it in the Grand Foyer, right inside the front door. After the show, my son and I, along with our friends from Ramshackle Solid, headed down to the Discovery Center. 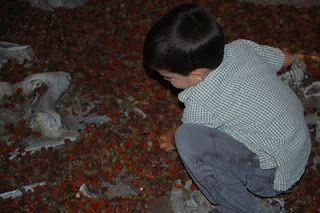 Among other things, the boys swept plastic chips off of (fabricated) dinosaur bones in the excavation pit. Then it was up to the second floor for another episode of Dinosaur Encounters. 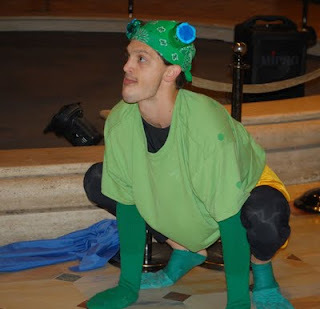 I was surprised to see Frogman evolved into a paleo pal, who quizzed kids on dino facts. What did this dinosaur eat? How can you tell? If you're planning a visit soon, don't miss the Butterfly Pavilion. Wondering why you didn't know about all these great activities? I confess it's not that I'm so smart...I'm a member. Members, of course, get newsletters with the latest.